« Planning My First Kayaking Trip! How delightful to spend a day paddling one of the prettiest rivers in Florida, the Wekiva River. 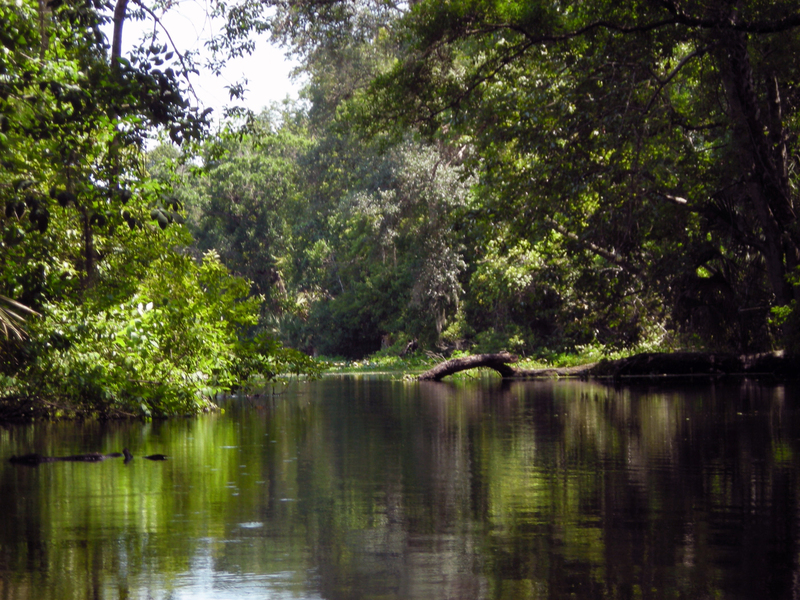 Wekiva means “flowing water,” and Boning explains that it is the only Florida river to receive the recognition of a Wild and Scenic River at both the state and federal level. I paddled the Wekiva with my sister, Missy. Our experience was wonderful. We put in at the Wekiva Marina late morning and paddled north for two to three miles on a quiet little river canopied with vegetation. We did not see a lot of wild life, (except the teenagers that appeared later in the day), most likely because we paddled on a Saturday, and by the end of our day, the river bustled with kayakers and canoers. We did see egrets, a great blue heron, and a few other species that we were unable to identify. Turtles sunned themselves on logs. Beautiful lilies and deadly water hemlock (it resembles Queen Anne’s lace) encroached the waterway, giving us only a narrow passage in some parts of the river. Oak, cypress, and cabbage palms decorated the banks. Below us, golden eel grass swayed with the clear current. It sounds like it was beautiful. I hope that your journey brings more beautiful areas to paddle. Great blog. Your pictures look lovely and apparently you do have a traveling companion (your sister?). Now we won’t worry too much. Have a great time. the pictures are beautiful. looks about as far from civilization as can be. Be safe: remember Deliverance?? Susan, your kayaking adventure sounds absolutely wonderful! Enjoy God’s creation and the peace that you gleam from it. Your adventures are fabulous… What a great doctorate program! I am jealous. I am jealous — that’s all I have to say! The peace and tranquility! The beautiful scenery! Toss me a line next time?